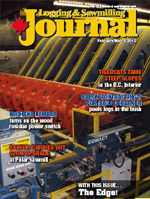 How much biomass can Canadian landowners realistically expect when growing wood fibre as a cash crop? The Canadian Wood Fibre Centre (CWFC) can help clear up the mystery of that question, based on quality science and an extensive field sampling program. Tim Keddy, CWFC Wood Fibre Development Specialist, says the Centre has completed extensive sampling of short rotation woody crop plantations (SRWC) featuring different tree varieties grown on different soil types right across Canada, which provide landowners with some realistic growth and yield numbers. SRWC pertains to either high yielding, large diameter (>15cm) hybrid poplar or aspen in an afforestation design or small diameter willow or hybrid poplar grown in a concentrated design. Keddy describes afforestation as orchard style plantations with 1,100 to 1,600 large, high yielding stems per hectare on agricultural land grown over a single rotation of 12 to 20 years. This biomass is typically used in pulp, oriented strandboard, or bio-product manufacturing. With this style of cash crop, CWFC targets a yield of 13.6 cubic metres per hectare per year. Concentrated biomass plantations have 13,000 to 18,000 stems per hectare, Keddy says, with the woody biomass harvested on a three to four year rotation and harvested six or seven times over their productive lifespan. This wood is typically used for biofuel, bio-remediation or bio-product manufacturing. CWFC predicted growth and yield to average 7 to 11 oven dried tonnes of biomass per hectare per year. Regardless of the design, SRWC growth and yield results come down to three important factors. These are: site suitability, clonal selection, and plantation management. Keddy says that it is important that the landowner pay attention to all three of these important factors. Clonal selection is the tree varieties selected by the landowner for his/her particular site. The goal is to unite the correct clones with the correct sites. That’s where CWFC demonstration sites located throughout Canada can benefit landowners because they demonstrate growth and yield for a wide variety of clones in many different geoclimatic zones. Landowners can visit these sites and determine what clones are best suited for their particular sites. Plantation management refers to the level of vegetation management the landowner adopts. CWFC researchers have found that growth and yield are impacted significantly by the scale of vegetation management completed. When CWFC conducted its growth and yield sampling on 143 afforestation sites, it also classified each site according to how it was being managed and the impact each management regime had on predicted growth and yield. The three management regimes used to characterize each site were intensive management, sporadic management after year one, and no management after year one. Each site was sampled and the actual volumes compared to the growth and yield expectations predicted by the CWFC site suitability model. On sites that were intensively managed, growth and yield was on average 5 cubic metres per hectare higher than predicted, on sites sporadically managed it was 6 cubic metres per hectare lower than predicted and on sites with no management, it was 25 cubic metres lower per hectare than predicted. Concentrated biomass plantations have delivered average growth and yield of from 7 to 11 oven dried tonnes of biomass per hectare per year. Alberta has a strong desire to advance its bio-economy. As part of its strategy, the province has created the Alberta Biomaterials Development Centre (ABDC) to help the forest and agriculture industries resolve any technical issues, to help them move closer toward investing in new bio-products. Biofibres available from both industries offer many attractive attributes. They are biodegradable and come from a sustainable, rapidly renewable resource. Biofibres can also lower the weight of a traditionally heavier product, significantly improve the structural performance of a product, and they can easily replace polystyrene and polyurethane foam in structural insulated panels and compare in R-value. They also offer a raw, natural look that enhances the attractiveness and appeal of a finished product. ABDC uses a one-stop-shopping approach that invites researchers and companies from around the world to test methods and technologies for producing new and enhanced materials, chemicals and energy from biofibre feedstocks. It offers access to expertise, test facilities, scale-up equipment, validation prototyping, and customer-demonstration support. Price adds that using the one-stop-shopping approach is critical for encouraging industry to use ABDC’s services. 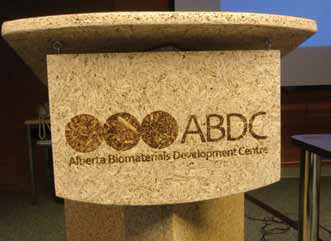 ABDC is supported financially by a consortium of agencies involved in advancing the bio-economy in the province, including AI Bio, the Alberta Department of Sustainable Resource Development (SRD), Alberta Agriculture and Rural Development, Alberta Advanced Education and Technology, and Alberta Innovates Technology Futures (AITF). In addition to technical support, ABDC can also steer clients toward different funding initiatives that may be available from the various agencies within the consortium. Price says that because of the forest industry’s strong connection with SRD, it will likely be one of industry’s primary conduits for tapping into ABDC services in future. He adds that ABDC provides a number of key laboratory tools that assist in the development of new markets and products. Biomass can be broken down through the use of heat and/or chemical processes into its constituent parts, those being cellulose, hemicellulose and lignin components. “Any one of those three streams could be used for a new market opportunity,” says Wilkinson. “Lignin is the most interesting one from our point of view because it can be used for heat, and in combination with nanotechnology to produce a number of product streams.” However, he adds that both cellulose and hemicellulose also lend themselves for use in a variety of new products. In 2009, the consortium made an initial $15 million investment in new equipment and to establish the network of scientific and technical expertise that is now available through a single portal to industry. With equipment located at AITF’s research facility in Vegreville and the University of Alberta’s Agriculture Discovery Place in Edmonton, ABDC links research, technology, and business to bring new products derived from forestry and agriculture-based fibres to market faster. As ABDC works toward establishing a solid foundation of available services with dedicated staff from the various consortium members, the Centre is putting out the welcome mat to better inform industry of its capabilities. It is interested in hearing from industry—as it develops its new strategic plan—on how it can tailor its menu of services to address specific needs that, for example, may be unique, and in high demand from the forest industry. 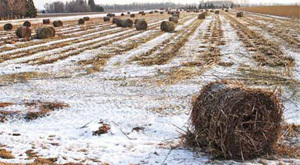 To this point, ABDC has helped forestry clients investigate how they can capitalize on both available forest and agriculture fibre in pursuit of bio-products, starting with the potential size of the available fibre basket by different fibre types. Companies have also shown an interest on subjects such as the use of enzymes related to new pulping processes or new product development, and development of bio-composites, which could perhaps help Alberta’s idled oriented strandboard plants resume operations. For more information about ABDC, visit www.albertabiomaterials.com, or contact ABDC Program Leader, Trevor Kloek, at Trevor.kloek@albertabiomaterials.ca. Other contacts include AI Bio Executive Director Steve Price at (780) 427-2567 or steve.price@albertainnovates.ca, or SRD Executive Director for the Forest Industry Development Branch Dan Wilkinson at (780) 427-6372 or dan.wilkinson@gov.ab.ca.